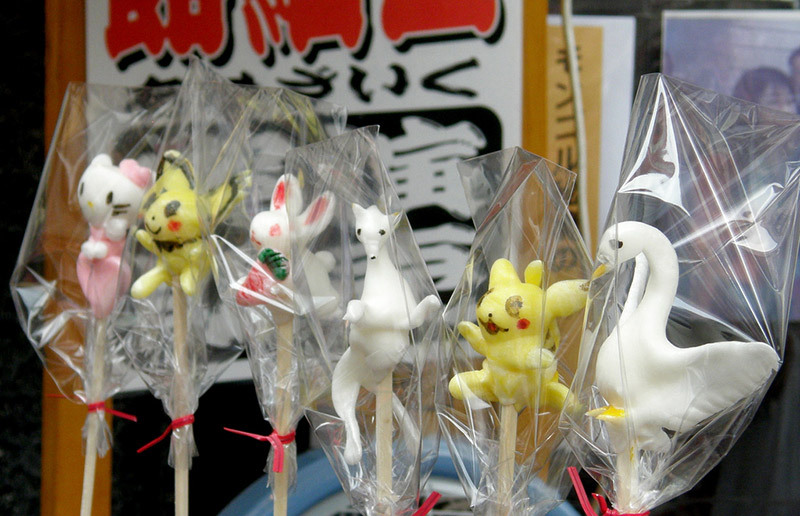 Amezaiku: Japanese Candy Creatures Born from Sugar and Fire Fun to eat. Fun to watch getting made before you eat. In traditional Japanese cuisine, it’s not enough for something to taste good, it has to look good too. This is particularly true of sweets, which are often just as much a handicraft as a food. The most famous example of this is the seasonal wagashi sweets traditionally made for the tea ceremony, which look more like tiny sculptures of flowers, fruits, and other seasonal symbols than something to eat. Amazingly, candy sculptures aren’t restricted to high society. Common people had them too. Even their children had amezaiku. 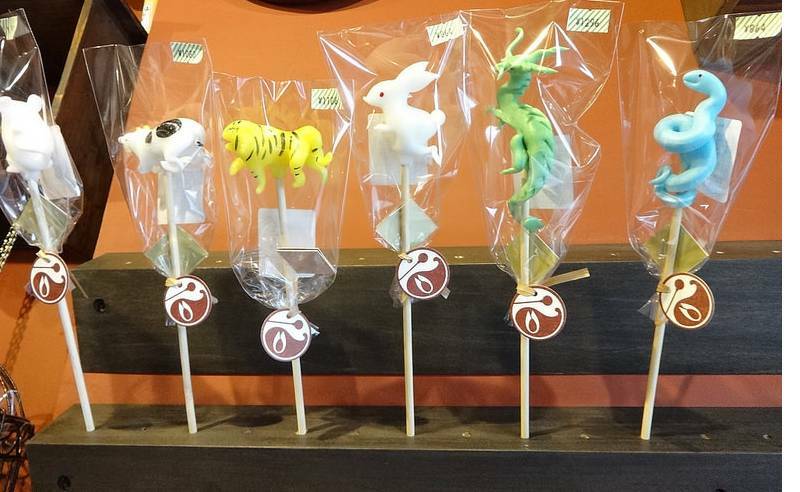 This unique craft of making intricate sugar figures of animals and other creatures was once commonly practiced by street vendors, but recently it seemed at risk of dying out, restricted by new health regulations and losing the competition with more modern forms of fun. But now, new craftspeople are keeping it alive and adding their own personal take on the tradition. Amezaiku, unlike other candies, is edible entertainment, as much performance as sustenance. One place where you can watch the mesmerizing act of amezaiku creation today is Amezaiku Yoshihara in Sendagi, Tokyo. If you buy one of the already-made creatures (like the ones pictured above), you miss out on the best part. To do watch the show, first make a choice from their catalog. Amezaiku artisans can make giraffes, dragons, snails, octopi, koalas, wild boar, owls, flamingos, different breeds of dogs, and many more. They also have seasonal specials, like their own rabbit mascot dressed up in Halloween outfits. 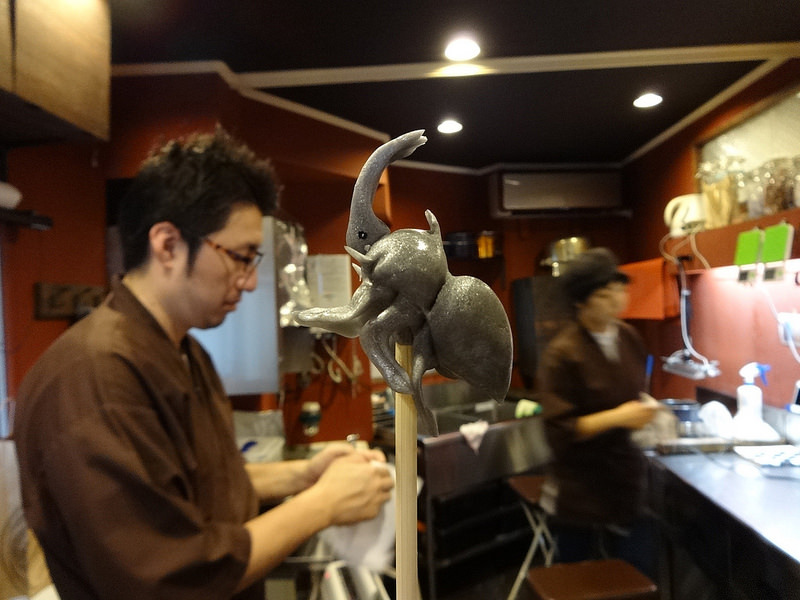 When I was there, I wanted something quintessentially Japanese but, I have to confess I also thought, “what’s the point of watching him make something easy?” So I picked a Japanese rhinoceros beetle, the kind that’s kept as a pet. With its thin legs and antenna, it looked like the most challenging of the lot. The amezaiku artisan’s material is a boiling pot of mizuame, a sugar syrup made from rice or potato starch, similar to corn syrup. 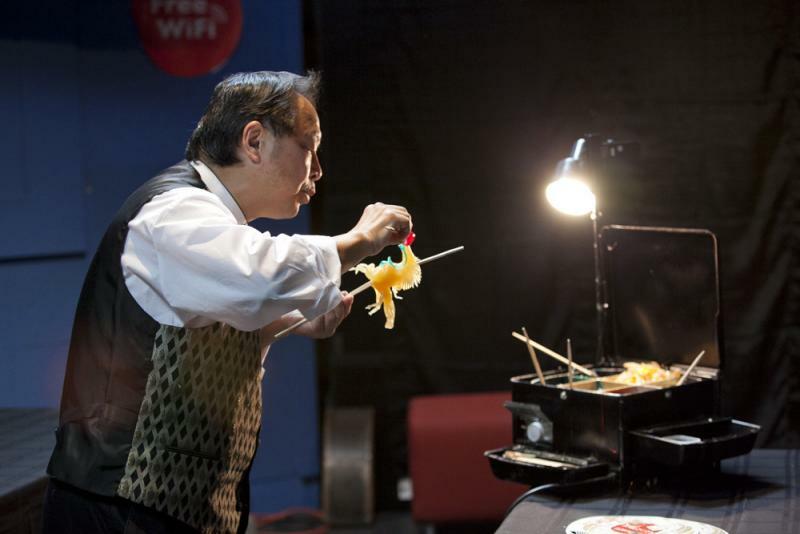 Grabbing a glob of the molten mixture and holding it above a small fan, he tosses and stretches it like taffy until it reaches the right temperature. 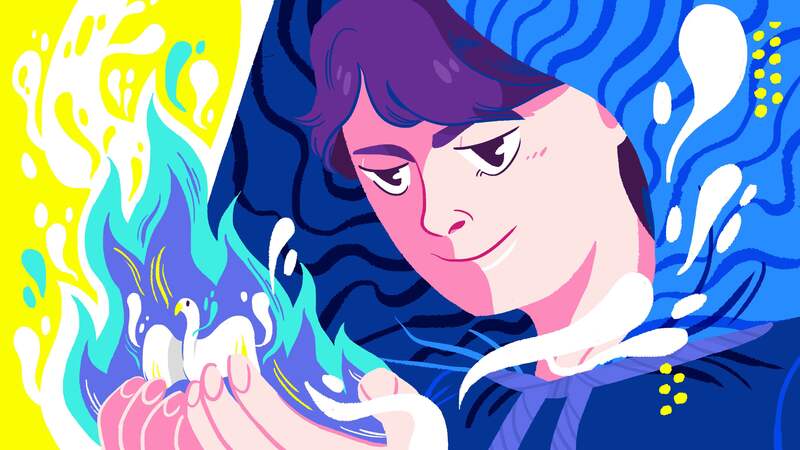 The mizuame is white so, if the creature is meant to be a different color, the artisan adds a drop of coloring, which mixes in as he stretches and kneads. When the material is the right consistency, he compresses it back into a glob and inserts a long wooden lollipop stick. Then, using only his fingers and a small pair of special scissors, he makes tiny cuts and pulls the candy into legs, ears, wings, or antenna, depending on the creation. 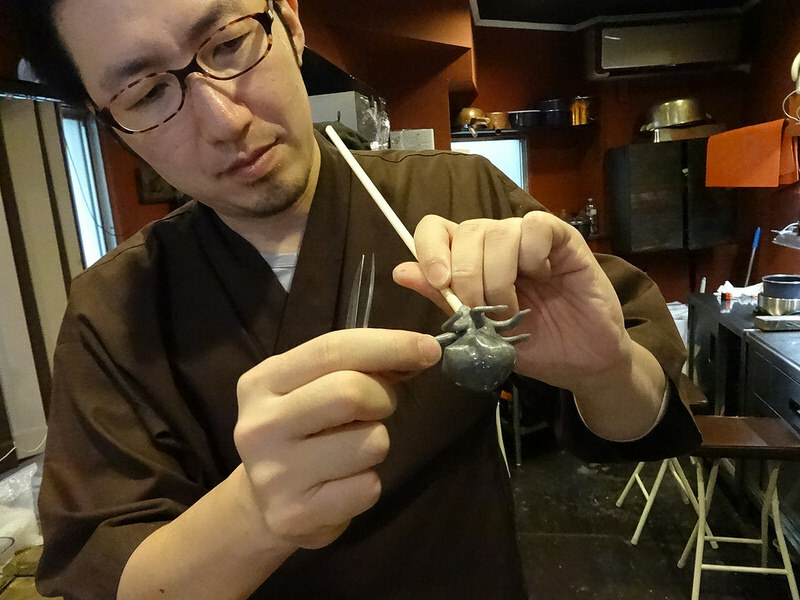 You can see a video of him making a cute octopus here. He has only a few minutes to make the figure before the candy becomes too stiff to work with. When he’s done, he taps on it with his fingernail to show you that it’s hardened. He paints on details with a tiny brush, then wraps it carefully and you’re good to go. Don’t ask me how it tastes. It’s been over a month now and I haven’t had the heart to eat it. I’m not sure I ever will. Some sources say that amezaiku goes all the way back to the eighth century, when a candy puller made an offering at the completion of the temple To-ji which was built when the capital was moved from Nara to Kyoto. But what’s recognizable as amezaiku today probably started in the Edo period, where it was known as “ame no tori” or “candy birds” since that was the usual shape that was made. The technique was actually different in the old days: the craftsman put the glob of candy on the end of a hollow reed and blew air into it, rather like glassblowing. The result was a hollow candy, less intricate than we see today. It is said that the ninja disguised themselves as candy workmen and wandered through the town, collecting information on the techniques that each candy puller used. The talents and secrets of the different pullers were collected, and more complicated technology and designs were collected, making the candy pulling ever more complicated and beautiful. Amezaiku makers didn’t have shops. They were traveling vendors. The video below is a traditional call of a vendor entreating children to come and buy candy birds. The fact that amezaiku vendors made their wares on the streets contributed to the decline of the craft in the late 20th century. In the 1970s, health laws prohibited candy from being made in street stands, and also outlawed the old technique of blowing hollow candies, because you’d have the craftsman’s germs on the inside of your candy. 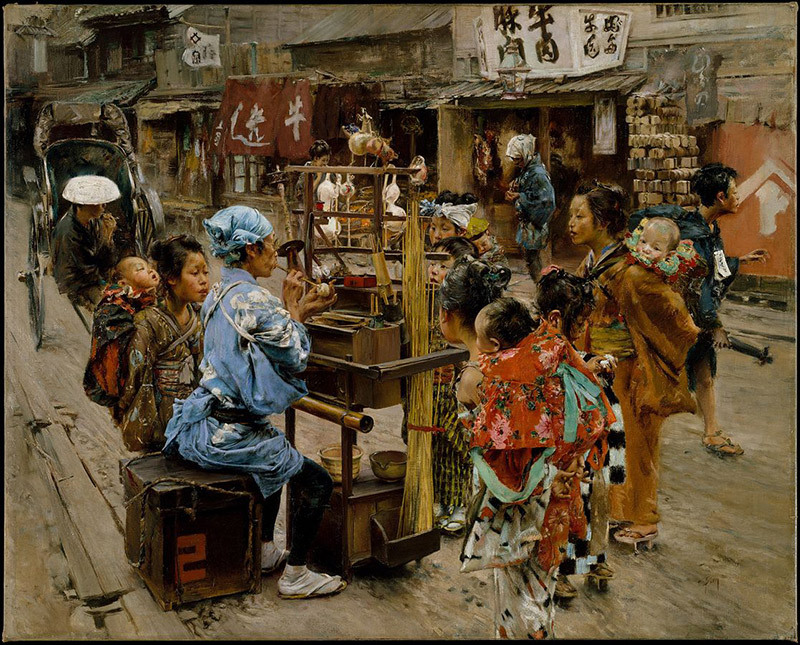 Making a living as a candy vendor on the street was always hit or miss, but eventually it became impossible. The remaining artisans hired themselves out for festivals and private events. In 1995, an amezaiku maker included in a book called “Vanishing Japan” was said to be the last experienced one in Tokyo. He said that his customers at that point were mostly young women, rather than children. Kids were too busy with scheduled activities, he said, but no doubt amezaiku faced stiff competition from the burgeoning world of TV and video games. As is clear from the fact that there are current practitioners to quote, amezaiku hasn’t vanished completely, and new practitioners are taking the craft to new places. The success of this shop was a good sign for the craft, but when there’s only one of something, it’s hard to have confidence that it’s not on the brink of disappeaing. However, there’s now a second shop. Opened in 2013 in Asakusa, Shinri Tezuka of Ameshin has his own style, using clear sugar and painting on translucent layers of color. To increase interest in the craft, both places offer workshops where you can try it yourself (although remember, you’ve still got nerve endings to burn off). These are the only two shops, but they’re far from the only amezaiku makers left. Others still do it more or less the old way, travelling around and appearing at special events, although they’re modernizing the business in other ways. Some are on the internet, of course: You can read the blog (in Japanese) of a woman in Nagano who has her own company. And Takahiro Mizuki, another Tokyo amezaiku maker, has a website in three languages, Japanese, French and English. Mizuki makes traditional figures but is just as happy to make modern characters like Pikachu and Winnie the Pooh. Amezaiku is still seen as something old-fashioned – Takahiro Mizuki writes that, much to his amusement, he’s even heard elementary school children call it “nostalgic.” But it looks like, while they might have had a close call there for a while, these candy creatures have been saved from extinction.